Digital Marketing for Graduates is an affordable and fast online training programme for university graduates (or any beginners), who are keen to embark on a career in digital marketing. Specifically, we are helping to bridge the digital skills gap (for digital marketing roles) that is being widely reported in the UK media. Our training not only teaches the graduate about digital marketing – arming them with skills they can go off and practise, but it walks them through the recruitment process and helps them create a successful application – and excel at interviews. So far we’ve managed to help over half of them get their first job. Industry trends suggest that by the end of 2017 there will be 750,000 unfilled digital job vacancies in the UK. A significant portion of those will be digital marketing roles. When I saw this statistic, I started thinking about my own experience and what I could do to help. At the time I was training a team of journalists and marketers who worked for one of the big UK publishers in Appstore Optimisation. It occurred to me that I could use my 12 years’ experience working in digital marketing and my experience training marketing teams to help solve this problem. I know there is a problem to solve (as mentioned above). Additionally, from talking to recent university graduates a few trends started to emerge, namely: “how do I get experience, when all the employers demand I have experience” and graduates are naive about what employers really want to see on a CV and at interview. Many graduates struggle to get a job because they don’t know how to sell themselves and when you are applying for a marketing job, being good at selling yourself and providing relevant information is vital. I run a marketing consultancy business where I offer digital marketing services to a broad range of clients from garden centres to publishers. Currently the business is self-funded. I am looking for funding in the form of a loan to help with operating costs initially and investment to grow the business. We sell online training directly to recent graduates. Each course is priced £299 and the graduate has lifetime access. In the near future we hope to work with digital marketing employers to be able to offer all of our successful graduates a guaranteed interview. We would then charge the employer a fee and give the student a portion of their money back. Ideally I’d like to get to a point where all the training places are industry funded and the students can take the training free of charge. Our main challenge is that graduates don’t think about training to get practical experience. For the graduates who don’t get onto a grad scheme (that’s about 90%) they get a bit stuck in a rut, and don’t know where to turn, often simply applying for more and more roles, hoping that someone will call them for an interview. We are here to show them that there is a better way. To overcome this, I started offering the training to recent grads, who didn’t yet have a job, free of charge. So that I could get some testimonials and proof that the concept worked. My first big breakthrough was when one of our recent graduates emailed me half way through the training to tell me that she had been shortlisted for an interview and then a few days later she told me she got the job. I was thrilled and she said she felt much more confident at interview because of the training. Now I’m keen to help as many graduates as I can make the most of themselves and tech them the skills that employers want. Don’t give up when the going gets tough. If you are working on a business alone, like I am, I recommend having a pool of people who you can talk to for inspiration and a pep talk every now and again when you need it. 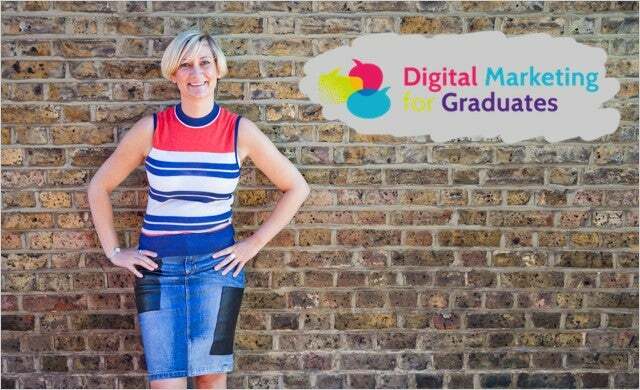 In five years’ time I want to have helped over 50,000 graduates into industry and established Digital Marketing for Graduates as the go to place for companies looking to hire graduate marketing talent. I believe that this type of pre-employment training is the future. Especially as universities do not teach these practical skills and not every graduate can afford to work for a company for months at a time free of charge.